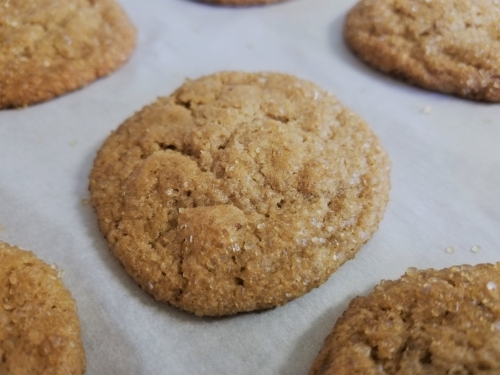 For a potluck, I made these classic fall molasses cookies — but I had no molasses in my pantry! So, I subbed maple syrup for the molasses and instead of ginger, I used pumpkin pie spice. They turned out SOOOO yummy. I highly recommend the switch! Marbled Pumpkin Muffins - these are to DIE for! I’ve made them twice and doubled the recipe each time. I’ve popped them into the freezer so I can enjoy them for a few weeks! Freezer muffins are a must-have with a newborn. Salted Tahini Cookie Dough Bites - Yum! These are different, but equally good. I recommend using mini chocolate chips if you can. Zucchini Brownies - I made these twice as well and they are deelish! Take her advice and pop them into the fridge. It keeps them together better and it makes them taste like a fudgy treat! I promise to come back soon with more tasty treats! For now, I’m just hustlin’ and snugglin’ my kiddos as much as I can. Thanks for staying with me.